At Front Sight Firearms Training Institute, fear is a booming business. We’re in the back corner of the dining room of the Mountain Falls Golf Club in Pahrump, Nevada, about an hour west of Las Vegas. A trim man in his 60s, Meacher wears a polo shirt tucked into pressed khakis, a scoped Glock and two magazines on his belt. Over his shoulders, the 18-hole green and water features contrast sharply with the bleak rocks of the Nopah range beyond. Meacher is the vice president and chief operating officer of the Front Sight Firearms Training Institute and Resort, the largest private-sector institution of its kind in America. His work involves conjuring the image of such scenarios, encouraging others to be on guard against them, and, not coincidentally, enticing them to travel to Front Sight’s massive complex in the Mojave Desert and pay thousands of dollars to train with guns accordingly. Meacher tells me that in any given year, more than 35,000 people will. Today, Cooper’s words are echoed in countless online forums, pro-gun websites, and gun ads—and after every high-profile mass shooting, calls for Americans to buy guns and prepare to defend themselves proliferate. After the Orlando shooting this past June, Florida news outlets reported not just a drastic increase in gun sales—well over 110 percent from the same period last year—but also a surge in enrollment in firearms-training courses. Nationally, there isn’t much coherence when it comes to laws linking gun ownership and training. “Primary responsibility for regulating guns remains with the states,” explains Adam Winkler, a law professor at the University of California, Los Angeles, “and because of this, you have a lot of different gun-control regimes out there.” As of the end of 2015, 15 states required a permit or license to own or purchase a handgun. Of these, six had mandatory training requirements; the other nine did not. When it comes to carrying a concealed weapon, things get even more complex. As of July 2016, some 14.5 million Americans have been licensed to carry a concealed weapon, but 11 states don’t require a license. Reciprocity agreements further complicate the picture. For example, any Pennsylvania resident who passes a background check, fills out a page of paperwork, and pays a $20 fee can receive a license to carry firearms that will be honored in 30 other states. Over 1 million Pennsylvanians currently have such a license. But if they carry a concealed handgun into Delaware, they’re committing a felony—unless they also have a nonresident permit from a state like Arizona ($60) or Florida ($102), in which case they’re in the clear. Arizona and Florida both require training in firearms competency; Pennsylvania does not. Over the last 30-plus years of liberalizing gun-carry laws, the market for trainers (NRA- certified and otherwise) has grown. But “competency” itself is a moving target. In some states, all that involves is sitting through a lecture on the basic rules of firearms safety: Don’t point your gun at anything you don’t want to shoot; treat all guns like they’re loaded; keep your finger off the trigger until you plan on firing. Other states spend hours walking students through the laws on self-defense, liability, and safe storage. Not all states require applicants to demonstrate ability to operate a gun: In Florida, firing one bullet is enough. Although Americans are generally more familiar with the National Rifle Association’s lobbying activities, the NRA also maintains a national network of certified firearms instructors. In states that mandate training for a concealed-carry license, the NRA’s Institute for Legislative Action frequently takes a role in helping legislators draft the law—and in funneling applicants for such licenses to the NRA’s standardized courses. Such courses represent revenue for the NRA, and they’ve grown at breakneck speed: In 2013, 55,000 instructors were training some 750,000 Americans; by 2016, those numbers had risen to 125,000 instructors and 1 million students. Indeed, over the course of the United States’ unprecedented liberalization of gun-carry laws in the last 30-plus years—concealed carry, open carry, campus carry—the market for trainers (NRA-certified and otherwise) has grown. But while many states don’t have training requirements, many gun owners still want to train; others want to go above and beyond their state requirements or the very basic NRA offerings. Enter the private-sector players. Numerous firearms academies offer advanced training on dedicated campuses in several states; the larger ones will train several thousand students a year. On the far end of that spectrum—to the point that it is effectively sui generis—is Front Sight. 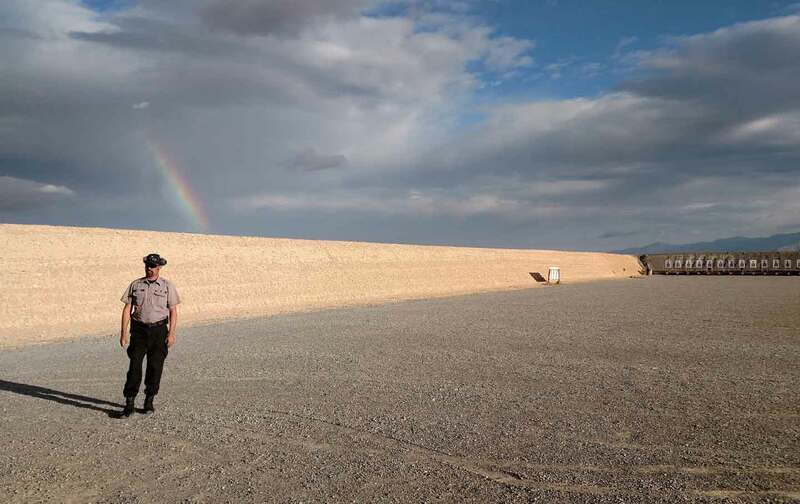 Situated on a dusty 550 acres in Nye County, Nevada, the sprawling facility includes 24 outdoor ranges designed for pistol, rifle, and shotgun training; eight simulators, including “shoot houses” that mimic dwelling places; gunsmith facilities; an armory; and more. Lasting from two to four days, the courses at Front Sight run the gamut from defensive handgun use to long-range precision rifle shooting to training with military-style M16s and Uzis. The classes are geared for different levels of expertise, from beginner to advanced to “combat master.” Front Sight promises a caliber of firearms training light-years beyond that required by any state in the nation, raising “responsible citizens to levels that far exceed law enforcement and military standards.” Not counting the considerable cost of ammunition, lodging, and travel, a four-day course at Front Sight will run $2,000. I’m not currently a gun owner, although I have owned guns in the past. Shortly after Sandy Hook, I wrote an op-ed about a run-in I’d had with a would-be prowler that soured me on personal gun ownership. Proficiency at shredding paper targets and breaking clay pigeons, I learned, didn’t translate into much besides panic when someone tried to jimmy open my back door in the middle of the night. I didn’t take any particular policy stance—just confessed my rude awakening to the gap between fantasy and reality—but that didn’t matter much to pro-gun readers, who inundated my mailbox with threats. Buried in that avalanche of ugliness, though, was something different: a note from a former soldier. He and his friends had decided that I suffered from “unconscious incompetence,” a false confidence in my own untested abilities, and that I had neglected a necessary ingredient: training. If I were willing, he wrote, a buddy of his would transfer a Front Sight membership to me. The only condition was that I take a course and write about my experience as honestly as I could. He’d even spring for another membership to bring a friend along with me. I accepted this generous offer and enrolled in Front Sight’s most popular class, a four-day defensive handgun course, supplementing it with a one-day concealed-carry class. An old friend, photographer and journalist Evan Simko-Bednarski, accompanied me. You get to Front Sight by turning off Nevada State Route 160 and driving west. Another turn, and the macadam gives way to bumpy gravel: Front Sight Road. There’s a harsh majesty to the landscape, with mountains rising up all around, hemming in the Pahrump Valley’s dry, cracked arroyos. The soil is clay and silt, sprinkled with creosote bush, hedgehog cactus, and other hardy scrub. A guard waves us through a security gate, past a complex of flat, prefab administrative buildings. An American flag flies over everything, and beneath it a yellow Gadsden flag: Don’t Tread On Me. Some 200 cars sit in a gravel parking lot, with plates from around the country. Uniformed employees are everywhere. All are visibly armed. After picking up our ammo (1,200 rounds), gear (holsters, belts, hearing protection), and handgun rentals (a pair of well-used 1911 Springfield .45s), Evan and I enter Front Sight’s main building. From outside, it looks like a Mission-style hacienda: adobe walls and terra-cotta tiles, squat palms, a gurgling fountain. Inside, it feels like a church basement, with wooden tables stretching from one end of the room to the other. According to Front Sight’s Rick Morello, “the world is a dangerous neighborhood,” and we must be prepared for violence at all times. There are some 350 students in the room. The crowd is more diverse than you might expect. In front of us sits a white woman with deep-red dyed hair and a full-back tattoo of Chinese characters. To our right is a lean, olive-skinned man with a perfectly groomed five-o’clock shadow. He’s got a desert-camo baseball cap with a patch that reads Infidel on his head and a keffiyeh around his neck. A black woman in her 30s sits next to him, her hand on his forearm. About a quarter of the students are women. There are around 20 African Americans that I can see, and about as many Latinos and Asian Americans. At least a dozen children are seated around the room. Farther down our table, a white woman and her teenage daughter wear matching pink Front Sight hats. Even so, the overwhelming majority of people here are white, male, and skew middle-aged or older. After a brief lecture on basic gun-range safety, we sign a stack of liability waivers and then break up into smaller groups. Fraternizing isn’t exactly encouraged, and the emphasis on security culture is intense: People go by first names only, writing them on tags affixed to our hats, or by aliases or nicknames. Some have professional motivations: At least two are in law enforcement, the military, or private military contracting. Others have their own reasons. Over four days, we spend just over 30 hours shooting and just under three hours in lectures. These include “The Color Code of Mental Awareness and the Combat Mindset”; “The Moral and Ethical Decisions Associated With the Use of Deadly Force”; and “Criminal and Civil Liability.” Their overall thrust, captured succinctly by Front Sight’s operations manager and range master, Rick Morello, is that “the world is a dangerous neighborhood,” and we must be prepared for violence at all times. Morello pitches a “solution” to this state of vulnerability: “Condition Yellow,” or active vigilance. To illustrate the hazards of Condition White, Morello tells us a hypothetical story. A Nevadan is walking in New York City, an iPhone in one hand, a briefcase in the other, a pair of $4,000 cowboy boots on his feet. The man is absorbed in his iPhone’s screen. A “bad guy” sees he’s in Condition White, leaps at him “from a firebreak,” robs him, and cuts his throat. When Morello says “firebreak,” Evan and I—New Yorkers born and bred—exchange bewildered glances, then realize he means an alley. Morello reboots the scenario: The Nevadan, iPhone in his pocket, is now in Condition Yellow. He sees the alley and the bad guy, makes eye contact, communicates a silent “No way, hombre,” and moves on. No gun is drawn, no shots fired—but “Combat Mindset” saves his life. Morello tells us to “live in Condition Yellow,” that such vigilance is appropriate because of “how it is in the world these days.” Avoiding any dog-whistles—the word “thug” isn’t used once—the sources of fear Morello conjures are more about the generalized terror provoked by daily headlines than specific aggressors of any complexion or creed. That said, one trope invoked at least three times in this talk—and deployed all weekend long as the ne plus ultra trump card of horror—is the prospect of sexual violence against loved ones. “If you’re wounded, finish the fight,” he advises. “Or the other guy will have his way with your family.” We are repeatedly asked to imagine a home invasion, and fighting our loved ones’ would-be rapists till our last dying breath. But the odds of suffering such an assault are exceptionally low: According to the Bureau of Justice Statistics, from 2003 to 2007, nearly a third of all burglaries occurred when at least one person was home, but household members were the victims of direct physical violence only 7 percent of the time. 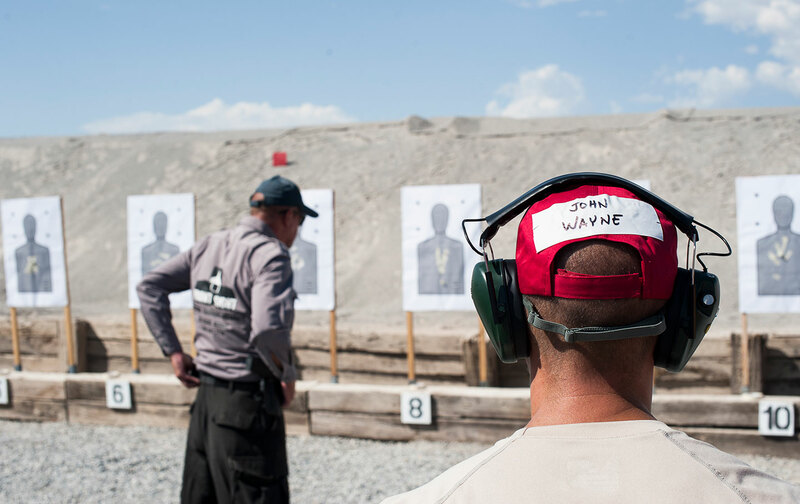 Front Sight’s firing-range curriculum takes an incremental approach. We spend most of the first day not shooting at all; instead, we adopt a buddy system and drill on safe firearms handling using orange plastic dummy pistols. Everything unfolds under the watchful eye of our lead teacher, Carol, and two assistant instructors. Then the lessons ramp up: We learn how to draw, handle malfunctions, fire “controlled pairs” to a target’s center of mass, and more. The Front Sight trainers write the name of my fiancée on the hostage target. While many in Pahrump quietly admit that they find Front Sight’s promotions embarrassing or even repulsive, Piazza’s marketing clearly gets customers in the door. And the plan is only to scale up. Front Sight is currently building another 26 firing ranges, with the goal of accommodating no fewer than 2,000 shooters at once. 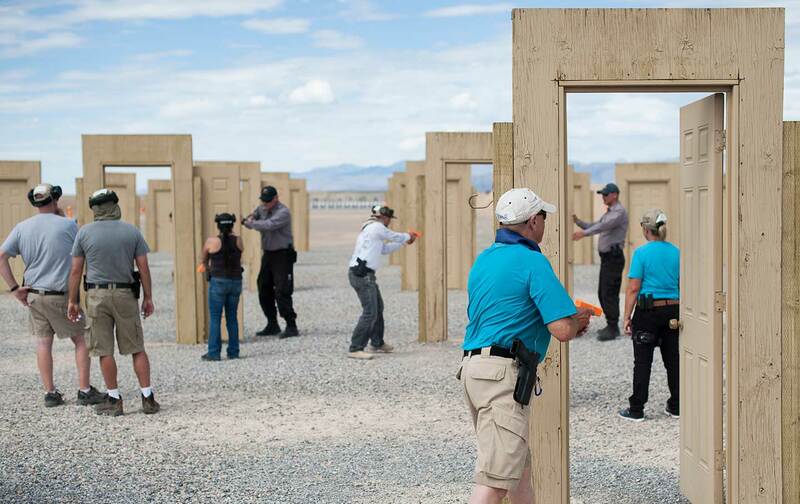 With ever more people pursuing firearms training nationwide, Mike Meacher thinks Front Sight is poised for enormous expansion. He shows us the blueprint for a massive development plan, spanning “dorms for college students who only have two nickels to rub together, to time-shares, to luxury houses for Fortune 500 guys who want to fly in once or twice a year to spend a week.” Meacher, who has a background in golf courses, wants to make Front Sight into something similar: a Disneyland or resort destination, but with guns. Planned “experiences” include using $25,000 computer-guided sniper rifles, virtual-reality gunfighting simulators, and a setup where anyone willing to pay $4,000 can hop into an all-terrain vehicle with a machine gun mounted on top and tear through a canyon shooting targets rigged with pyrotechnics. The number of Americans who have used guns to defend themselves is highly contested, in large part due to Congress’s NRA-backed opposition to such research. Privately funded studies of “defensive gun uses” (DGUs) put the number of Americans who have brandished or discharged a gun to avoid being a victim in a crime in the low thousands to an (absurd) 2.5 million a year. Extrapolating from the Bureau of Justice Statistics’ National Crime Victimization Survey, which relies on self-reported data from some 90,000 households, a team of researchers led by David Hemenway of Harvard University has estimated approximately 70,000 DGUs per year—while also questioning whether the presence of a gun was the deciding factor in those encounters (as opposed to, say, a baseball bat or a willingness to walk away). But Hemenway’s figure has also been challenged, and leading researchers wonder whether, when it comes to changing minds on guns, data actually matter at all. Current political rhetoric may give Americans the impression that their country is spiraling into violent chaos. But while recent months have indeed seen a marked and, as yet, unexplained spike in homicides in many urban centers, the broader picture for years has been one of steadily dropping crime rates. Nonetheless, since the early 2000s, a majority of Americans have told pollsters that they believe crime is rising. This perception correlates with increasing support for the proposition that gun ownership makes people safer. Jennifer Carlson, a sociologist who studies gun culture, has observed concealed-carry licenses skyrocketing in some states even as the crime rate plummeted. 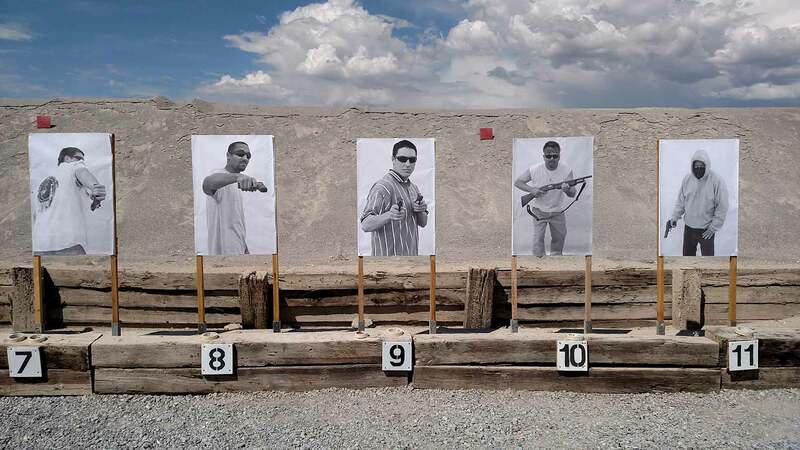 On our last day at Front Sight, the instructors produce a series of hostage targets: a human form in the center with two bad-guy heads peeking out behind it. We’re told to line up; then they ask us to spell the name of a person we love so they can write it on the hostage. Patrick BlanchfieldPatrick Blanchfield is a freelance writer and associate faculty member at the Brooklyn Institute for Social Research.